When I built Hyp3rL0cal I wanted it to be a working example of how developers could build local directories using CityGrid Places and Advertising API. Since I want developers to be able to take the local directory prototype and deploy for themselves, I wanted to bring it as close to compliance with CityGrid usage requirements as I could. To do this, I submitted Hyp3rL0cal for review by our partner account management team, to receive feedback on how to bring my local directory into compliance. Custom Ads API – To increase your click through rate for business listings which are advertisers, I strongly advise you to integrate our Custom Ads API and display these listings at the top of your search results page. You can view an example of how the Custom Ads API is implemented on Citysearch’s Search Results Page in the 4th screenshot under 3.6 Places that Pay. Mapping URL – Since you have your own profile pages built, you have the ability to re-direct ads to your own profile pages using the Mapping URL feature. This allows users to stay engaged in your site and maximizes your secondary connections opportunity. 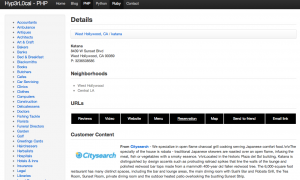 You can view documentation to our Mapping URL feature for our Custom Ads API and our Web Ads API. Ads Display - You can only display ads on profile pages for businesses that are non-advertisers. For example: You can view Katana’s Places Detail API response. You’ll notice an attribute that states “false”– this means you cannot display an ad for this business’ profile page. For businesses that are non-advertisers, their attribute will state “true”. Customer Message Attribution - You need to provide the proper attribution for Customer Message. Optional ‘Profile URL’ - Since you have all of the required content displayed on your own profile page, you don’t need to display the ‘Profile URL’ which re-directs to Citysearch’s profile page. Offer or Link – The Offer is not displaying correctly. If it may be difficult to get the full offer displayed correctly, you can choose to just display the link to view the full Offer. Our Usage Requirements give you the option to display either the entire offer or link. Footer attribution - For all pages with CityGrid content – Under 3.8 Attribution in our Usage Requirements, the proper Footer Attribution must state the following: “Powered by CityGrid; Data from Infogroup ©[YEAR]” . Search bar - Building a search bar in your directory increases user interaction and enables them open access to finding places they’re interested in. I just went through all this feedback and updated the Hyp3rL0cal PHP directory, and then updated the Github repository. The only two things I did not implement was the Mapping URL and Impression Tracker. I will make two separate posts out of this, much like I did with displaying ads on CtyGrid places detail pages. I will work to update the Python and Ruby Hyp3rL0cal prototypes as well as the WordPress local directory when I can. Hopefully we can some plug and play starter kits that are immediately compliant with CityGrid usage requirements, as soon as you install. I’m working through the feedback I received from the CityGrid partner account management team on my Hyp3rL0cal directory project. I want to make sure its as compliant as possible, so my developers can deploy as quick as possible, and get approved for revenue sharing. When reading through the Usage Requirements and Term and Conditions, its easy to miss some of the details. One of the details that went over my head, was displaying ads on places details. When you make a detail call against the CityGrid Places API, one of the properties you get back is “display_ad”. The “display_ad” field tells you whether a business is an advertiser on CityGrid network or not. If a business is an advertiser on the CityGrid network you cannot show advertisements on their places page. You are only allowed to show advertisements for business who are not already part of the CityGrid network. So make sure and check for the “display_ad” settng, because our partner acount management team knows how to check for this, and it will be one area you could possibly fail when being approved and become billable, sharing in revenue using the CityGrid Place API.